As we noted in our feature article, reviews programs do not work if they are too cumbersome. Doctors and their staff members are just too busy to constantly solicit reviews and then follow up to encourage patients to post them. The solution? The Ceatus Reviews Manager, which provides a one-step texting option that is very easy to implement. In this case study we discuss the case of a Florida eye surgeon who started using the Ceatus Review Manager’s Text Option in his practice. He was able to obtain an “A” grade on the healthcare sites just 7 months after starting the program. The most effective way to convince patients to write reviews is to approach them in the office when they are most happy about the procedure or service. Many practices email the patient or provide a card or brochure with links to the various public reviews sites. Unfortunately, many patients “never get around” to posting a review unless the staff constantly follows up. Staff members are too busy for this constant requirement. The Text Option is easy, and no follow-up is required. To use the Text Option, politely ask patients during the post-operative examination if they would be so kind as to share their experiences with others. Patients almost always say yes. Since the review is typed in on the patient’s own phone, the practice avoids any issues associated with using a tablet or other device in the office — namely, the fact that by using a device in this manner, the same IP address will be provided for all reviews; this is a problem because the rating sites do not allow multiple reviews from the same IP address. Our Florida eye surgeon started using the Ceatus Review Manager’s Text Option in the spring of 2015, and by the end of the year had achieved a grade of A on the top rating sites. 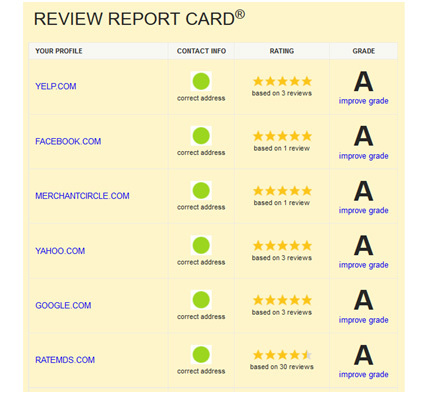 Each client that uses the Ceatus Reviews Manager receives a weekly report card showing his or her grades on the rating sites. Our Florida eye surgeon’s most recent report card is shown below.